The makers of the FiveM mod for Grand Theft Auto 5 have reportedly been banned from the Rockstar Social Club for creating an online world similar to, but separate from, GTA Online. FiveM makes use of dedicated servers to provide an online multiplayer experience while simultaneously supporting custom levels, assets, gameplay modes, and other mods, something Rockstar does not allow in GTA Online. In fact (and ironically), one of the primary purposes of FiveM was to comply with restrictions on modding in GTA Online, which Rockstar warned in May "could give players an unfair advantage, disrupt gameplay, or cause griefing." The moderator of the FiveM subreddit, Qaisjp, claimed on Reddit that he, creator NTAuthority, and support guy TheDeadlyDutchi were banned from the Social Club last week. "Dutchi has used mods before (but a very long time ago) and (as far as I know) NTA has never used single player mods (besides creating FiveM, of course). I found this out today, not too long before I started writing this post," he wrote. "NTAuthority and TheDeadlyDutchi was banned on Thursday as well... surprise surprise. I asked Dutchi what time he got the email... 1:52am. We were banned within two minutes of each other. It was certainly a manual ban. 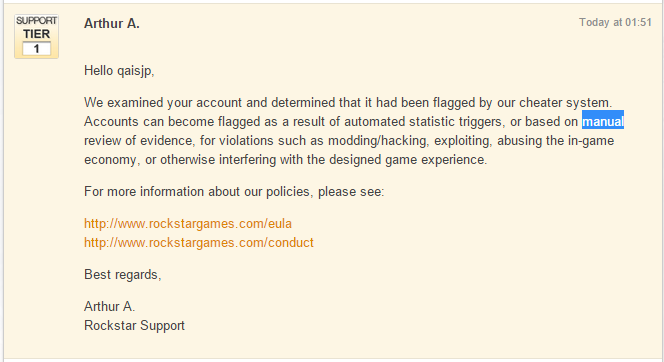 This completely rules out the possibility that I was banned for single player mods - the good news is that Rockstar doesn't seem to be banning people for just using single player mods. The bad news is that Rockstar is trying to stifle the modding community." Rockstar said in May that GTAV owners would not face punishment for using single player mods, but that mods affecting GTA Online were strictly off-limits. FiveM is in a somewhat hazy area as far as that goes: It's multiplayer, but doesn't make use of GTA Online. It does peripherally interact with the Rockstar Social Club as an anti-piracy measure, however, which user Ash Rogers said is what led to the ban in the first place. "FiveM uses a Social Club hook in, it did this to make sure PEOPLE OWNED THE GAME, as a piracy protection method so people couldn't just crack the game and still get to play MP," Rogers told Eurogamer. "FiveM is the only thing out there on the GTA modding scene to do so. Because of this piracy protection check, Rockstar have got angry and started to ban people. YES, people who CONFIRMED THEY PURCHASED THE GAME!" The bans impact all games that rely on the Social Club, meaning that single-player GTAV is no longer available, as are unrelated games like Max Payne 3. It's possible that they're unintentional—it happens—but that scenario is a whole lot less likely if they were done manually, as Qaisjm claims. We've contacted Rockstar for further information and will update if and when we receive a reply, but for now gamers are well-advised to avoid the FiveM mod altogether. Update: Qaisjp has put up a blog post clarifying several points about the mod. First, he insisted that using the mod will not lead to bans, as it is strictly single-player, despite the online component. Second, he said Ash Rogers' claim that the mod has a Social Club hook to determine whether the game has been pirated is false, and that no such check takes place. He also clarified that NTAuthority is the sole "creator" of the mod, while TheDeadlyDutchi "does forum stuff and general support." Perhaps most importantly, he said that as far as they know, no users of the mod beyond himself, NTAuthority, and TheDeadlyDutchi, have been banned. "It's not actually triggering bans to players—only three people have been banned and two of these bans were within two minutes of each other. This could either be an automated banwave or a manual ban, but nobody else but those close to the mod have been banned. In particular, I haven't played FiveM in months so it's impossible that I was banned because of the game client," he told us. "The game does have one hook, as stated here: 'FiveM does not use RGSC to verify your ownership of the game. The login is only used for identification purposes so that you can act as a unique player on dedicated servers'." He added that he hasn't yet heard from Rockstar about the bans, but hopes to contact them tomorrow.